In latest clip, activist Ezri Tubi shows link between activities of Breaking the Silence and radical anti-Israel incitement. Samaria activist Ezri Tubi's latest pro-Israel hasbarah video takes aim at the ultra-leftist organization Breaking the Silence. Featuring footage of a radical anti-Israel really, in which the Jewish state is accused of everything from "ethnic cleansing" to "apartheid," Tubi demonstrates the explicit connection between Breaking the Silence's activities and the incitement, bordering on anti-Semitism, against Israel. In his speech, one activist notes that former Israeli soldiers from Breaking the Silence spoke to the group about "how they were ordered to kill, to intimidate innocent people." 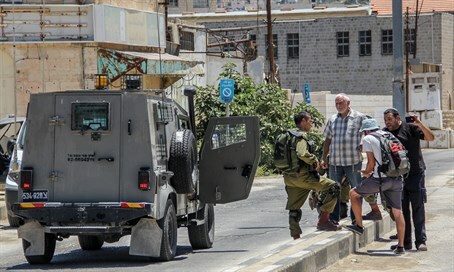 He also charges that soldiers from Breaking the Silence said they were told to "provoke mayhem, provoke chaos, to force the Palestinians into reacting" - essentially blaming Israel for the terror Palestinians inflict on its citizens. "There is a limit to the legitimacy in the discourse of Israeli society," Tubi charged. "Unfortunately, today, a certain group of leftist Israelis has decided to use lies and manipulation to blacken the State of Israel." "But, what is no less distressing is that the sane and Zionist left does not come out against this stupidity and thus loses credibility in the eyes of Israeli society." Breaking the Silence claims it is not anti-Israel, but simply wishes to promote human rights within the Israeli army. However critics have noted that it is funded exclusively by foreign donors - including European governments - and its activities take place almost exclusively outside of Israel and in front of audiences hostile towards Israel, with its aim appearing to be to blacken Israel's name in general, as opposed to provoking any internal change. The group has also been caught accepting false "testimonies" allegedly from IDF soldiers, and admits it has no real vetting process for verifying which claims are true.